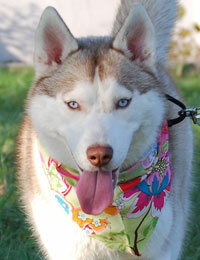 Kira is an eight month old Siberian husky female that is new to the MaPaw family. This pup is a spirited little red head that is full of life and kisses! She gets along with all dogs and people alike…if she had a motto it would be “do you wanna play, play, play???”. Kira’s favorite things include: food, playing, kisses, squeaky toys and daily trips to the dog park. Kira is very true to the breed and will need a sibe-savvy home with another active canine companion. In addition, Kira is still very much a puppy and will require a home with the patience and time to guide and train her so that she may blossom into a wonderful adult. If you are up to the husky puppy challenge and think Kira would be perfect for your pack, what are you waiting for? Kira’s ready to play!! !